This is a revolutionary new medical device called the Topaz MicroDebrider, offering a minimally invasive alternative for the treatment of tendons and fascia. This technology is rapidly being adopted by surgeons around the country specializing in sports medicine procedures. TOPAZ is the only radiofrequency Wand indicated for the debridement of tendons and fascia.I have used this technology with great success in hundreds of patients with plantar fascitiis and Heel spurs. 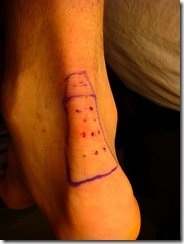 As well as in ankle arthroscopy surgery. I have presented this technique at conferences around the United States. The main advantage is quicker time to full recovery and less pain after surgery. Topaz is a quick, simple and minimally invasive medical technique available for the treatment of tendons and fascia. The Topaz MicroDebrider utilizes patented Coblation® technology, designed to specifically treat tendons and fascia. To date, over 5 million Coblation procedures have been performed. The Topaz technique has been associated with quick return to daily activities allowing for significant improvement in patient outcomes. Since launching TOPAZ with expanded indications for tendonotomy in 2005, Topaz is a minimally invasive alternative for thousands of patients for the treatment of tendons and fascia. I have performed the Topaz treatment with great success, for tendinitis. TOPAZ is a quick, simple and minimally invasive medical technique now available for the treatment of tendons and fascia. The TOPAZ MicroDebrider utilizes patented Coblation® technology, designed to specifically treat tendons and fascia. To date, over 5 million Coblation procedures have been performed. The TOPAZ technique has been associated with quick return to daily activities allowing for significant improvement in patient outcomes. Since launching TOPAZ with expanded indications for tendonotomy in 2005, TOPAZ has offered a minimally invasive alternative for thousands of patients for the treatment of tendons and fascia. 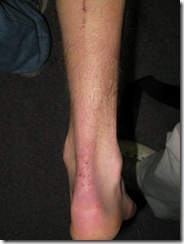 The surgical removal of tissue is often necessary for treatment of the tendons found in the small joints. ArthroCare Sports Medicine TOPAZ MicroDebrider utilizes Coblation® technology and is considered an alternative to standard invasive surgical procedures. TOPAZ enables the microdebridement of soft tissue present within the tendons of the knee, shoulder, elbow, ankle and foot. The TOPAZ procedure, in conjunction with Coblation technology, preserves the anatomical structure of the tissue while delivering a precisely controlled amount of radiofrequency energy to the tissue. While most radiofrequency-based surgical products, such as lasers and electrosurgical devices, use heat-driven processes to remove or cut tissue, Coblation-based devices operate at low temperatures. The TOPAZ Microdebrider allows for the execution of more precise procedures compared to those achieved with traditional surgical tools, which tend to destroy tissue structure under high temperatures. Coblation technology gently dissolves tissue, minimizing damage to surrounding healthy tissue. The revolutionary benefits of Coblation technology have led to its adoption across a number of surgical specialties, including shoulder and knee arthroscopic surgery, spine, neurosurgery and ENT surgery. Considered the gold standard, Coblation technology is now employed in more than 10,000 operating rooms and has been used in the treatment of over 5 million patients worldwide.